CUSCO keeps supporting Old-School Japanese Car owners and we newly added the item for Honda NSX owners. CUSCO Pillow-Ball Upper Mount set can be used for either Front or Rear. This set has x2 Upper Mounts per set. This can be used for Coilover Suspension set with different size of coil spring ID (Inside Diameter). Please select the proper product which can be used with your Coil Spring ID. 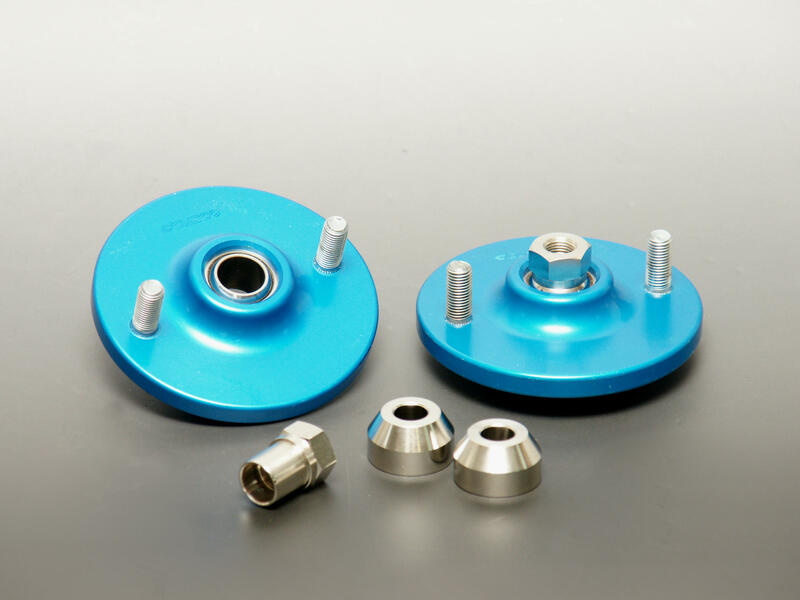 We have several type of Pillow-Ball Nut (M10, M12 or M14 Strut Shaft Thread on Top) and Collars (Shape, Thickness, Strut Shaft ID) to meet with your coilover system. Please look at following link to see the various sizes and select the proper size of nuts and collars when you order this product. We must have the specific size when you order. This set includes x2 Nuts and x2 Collars. ◆Designed for Honda NSX (NA1/NA2) models exclusively. CUSCO U.S.A. Competition Products are sold "AS-IS" without any express or implied warranty of any kind. To the fullest extent of applicable law and as permitted by law, the implied warranties of merchant-ability, fitness for a particular purpose and workmanship are disclaimed. Proper maintenance, installation and repair procedures for all motor vehicles and the safe and reliable operation of all motor vehicles are very important for personal safety. Motor vehicle competition and racing should only be performed by professionally trained drivers at properly maintained raceways and tracks. Standard safety procedures and precautions (including use of safety goggles/gloves and proper tools/equipment) should be followed and reference should be made at all times to any Factory Service/Repair Manuals to eliminate the possibility of personal injury, improper installation, improper use, improper service or abuse of the product, which could damage the vehicle and compromise safety. Carrosser/CUSCO U.S.A. and its affiliates are not responsible for any injury, damages of any kind, and loss of property for any reasons.